1. PAYMENT TERMS: Buyer must make the final payment, by cash or certified check, upon delivery of the Goods to Buyer at M&G's warehouse. All Goods remain the property of MARBLE & GRANITE INC. until final payment is received. 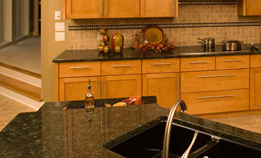 All prices are subject to adjustment, without notice, to MARBLE & GRANITE INC. prices at time of delivery. Orders cannot be canceled without MARBLE & GRANITE INC's written consent. 2. WARRANTIES. MARBLE & GRANITE INC, makes no warranties, express or implied, or guarantees whatsoever, including, but not limited to, warranties against scratching or wear on the stone surface, staining or shifting and separation of materials following installation, and is not liable for any variation in straightness, weight or dimension or any irregular markings, voids, veins, fissures, lines of minor separations, geological flaws, and shade or color variations of the Goods, including but not limited to, variations as a result of climate changes. MARBLE & GRANITE INC. shall not be responsible for expansion cracks, peeling or freezing in adhesive, concrete or concrete-based work or any damage to interior plaster or dry wall during construction. ALL SALES ARE FINAL. MARBLE & GRANITE INC. MAKES NO WARRANTIES OR MERCHANTABILITY OF FITNESS FOR A PARTICULAR PURPOSE OR ANY OTHER IMPLIED WARRANTY COVERING THE GOODS. IN NO EVENT WILL MARBLE & GRANITE INC BE LIABLE FOR SPECIAL, INCIDENTAL OR CONSEQUENTIAL DAMAGES RESULTING FROM THE GOODS. MARBLE & GRANITE INC's liability hereunder, in any case and at MARBLE & GRANITE Inc.'s Selection, is expressly limited to repair or replacement of Goods not complying with this Contract, or to the repayment of, or crediting Buyer with, an amount equal to the purchase price of the Goods. 3. Installation. MARBLE & GRANITE INC. reserves the right to make any changes in construction as may, in MARBLE & GRANITE Inc.'s judgment, be required by material shortages, other emergency situations or other causes beyond MARBLE & GRANITE INC.'s exclusive control. Without invalidating the Contract, Buyer may order extra work by the use of a change order, if signed by Buyer and MARBLE & GRANITE INC. Installation of Goods does not include any installation of any fixtures or faucets or installation of any appliances, including, but not limited to, sinks, garbage disposals and dishwashers. All dimensions shown in plans created by MARBLE & GRANITE INC. are approximate and will be reasonably accurate within normal construction tolerances. Unless specifically stated in this Contract, MARBLE & GRANITE INC. will not be responsible to correct or relocate hidden structural or mechanical items located in areas of demolition, breakthroughs, or construction tie-ins or for additional work required by other contractors procured by Buyer. If MARBLE & GRANITE INC. corrects and/or relocates such items the cost of such additional work shall be paid by Buyer. 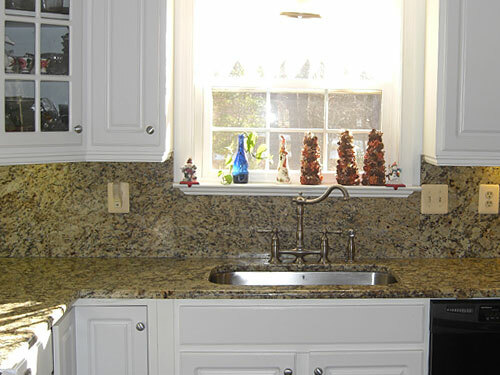 MARBLE & GRANITE INC. is not responsible for the inspection, discovery, abatement or removal of any hazardous materials, including but not limited to, asbestos' lead paint or radon, and that the Buyer, to the best of their knowledge, represents and warrants, that the Real Estate to be improved is free from any such hazardous materials. MARBLE & GRANITE INC. is not responsible for condensation on glass or surrounding surfaces and any removal or cleaning of any dust and debris created from the installation of the Goods. 4. Existing Conditions. MARBLE & GRANITE INC. is not liable for any existing conditions, or any delay in installation arising from the existing conditions, at the job address which violate building codes or other regulations, including, but not limited to, plumbing and wiring violations. Buyer agrees that should prevailing building codes require additional items to be done other than those specifically contracted for, such items are to be done by Buyer or priced as extras by MARBLE & GRANITE INC. Unless specifically stated elsewhere in the Contract, upgrades to existing electric, mechanical, or water service that may be required are not included and any additional cost will be paid by Buyer. If unusual or unforeseen subsoil conditions or obstructions below grade, such as clay sewer pipes, cisterns, old concrete footings, etc., require changing by local building department or to allow completion of the Contract, cost of making these changes are Buyer's responsibility. Buyer is responsible for charges from utility companies for relocations and/or upgrades of services to the existing structures. 5. ENTIRE AGREEMENT/SEVERABILITY/CONTROLLING LAW. This Contract, together with the attached written purchase order, represents the entire agreement and understanding of the parties hereto and super cedes all prior agreements, whether written or oral, between them with respect to the subject matter of this Contract. In the event that any one or more of these terms is held invalid, illegal or unenforceable, such provision or provisions shall be severed and the remaining terms and conditions shall remain binding and effective. Any change order or amendment to this Contract must be in writing and approved by an officer of MARBLE & GRANITE INC. MARBLE & GRANITE INC.'S employees do not have the authority to bind MARBLE & GRANITE INC. in connection with any waiver, change order or amendment to this Contract. The venue of this Contract shall be WILL County, Illinois. In the event Buyer's place of business is in a country that has ratified the United Nations Convention on Contracts for the International Sale of Goods (1980) ("Convention"), the parties agree to exclude application of the Convention. 6. FORCE MAJEURE. MARBLE & GRANITE INC. shall not be liable for delays in shipment or installment, damages or default in delivery for any reason of force majeure or for any cause beyond MARBLE & GRANITE INC.'s reasonable control, including, but not limited to: (a) government action, war, riots, civil commotion, embargoes or martial laws; (b) MARBLE & GRANITE INC.'s inability to obtain necessary materials; (c) shortage of labor, raw material, production or transportation facilities or other delays in transit; (d) fire, flood or other casualty; (e) acts or negligence of Buyer; or (f) cracking of natural stone products. In the event of any delay in MARBLE & GRANITE INC.'s performance due in whole or in part to any cause beyond MARBLE & GRANITE Inc.'s reasonable control, MARBLE & GRANITE INC. shall have such additional time for performance as may be reasonably necessary under the circumstances. Acceptance by Buyer of Goods shall constitute a waiver by Buyer of any claim for damages on account of any delay in delivery of Goods. 7. CONTRACT FUNDING & LATE PAYMENTS. Buyer understands and agrees that MARBLE & GRANITE INC. is not a creditor within the meaning of the Truth In Lending Act, 15 U.S.C. Sec. 1601, et seq. and is not a credit services organization; within the meaning of the Credit Services Organization Act, 815 ILCS 505/1, et seq. Buyer is solely responsible for obtaining any financing necessary to fund this Contract. If Buyer fails to make the final payment when due, MARBLE & GRANITE INC. may exercise any appropriate remedy or remedies. Acceptance of any late payment or waiver of any breach or default shall not constitute a waiver of another or any continuing, recurring, or subsequent breach or default. A service charge of the lesser of 1Â½ % per month or the maximum permissible rate will be added to all past due amounts. 8. CONTROLLING LAW/RIGHTS. MARBLE & GRANITE INC. retains all rights under the Illinois Mechanics Lien Law and all materials provided by MARBLE & GRANITE INC. shall be subject to the same. MARBLE & GRANITE Inc.'s acceptance of a note as evidence of debt or its taking a security shall not deprive MARBLE & GRANITE INC. of rights under the Illinois Mechanics Lien Law. All materials will remain the property of MARBLE & GRANITE INC. until final payment has been received.